The Alley Theatre has a spectacular day of doggy activities planned as part of Summer Jamm in Strabane on Saturday. 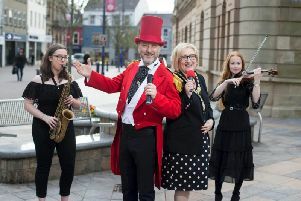 The Alley Theatre has a spectacular day of doggy activities planned as part of Summer Jamm in Strabane on Saturday, June 23. Starting at 11.30am, Replay Theatre and singer-songwriter Dan Leith brings us lots of furry fun with ‘Woofle’, a 30-minute show about one Dan and his dog with lots of silly songs. From chasing bees and getting mucky, to taking a walk and having a bath, this quirky combination of video footage and live music gives an unusual view of the ups and downs of having a dog as your best friend. With three showings at 11.30am, 1pm and 2.30pm there is plenty of opportunities to catch this show which is suitable for 3-10 year olds. Outside in the Alley Courtyard from 12-3pm there will be loads of children’s entertainment as Annette ‘Spaghetti’ brings lots of party games, balloon modelling and face-painting, plus there may be a few surprise guests! Kids can get creative with dog-themed arts and crafts and get bouncing on our disco bouncy castle. Dog owners are also encouraged to bring along their dogs to take part in our fantastic ‘Pooch Pageant Dog Show’ at 3pm. Plus there will be lots of fun classes with ‘waggiest tail’, ‘best dressed’, ‘prettiest lady’, ‘most handsome gent’ and lots more. There will also be dog safety talks and behavioural advice, dog stalls and lots more. Why not spoil your furry friend to this wonderful Summer Jamm bash? The event is a fabulous opportunity for you and your pooch to have some doggy fun and to enjoy the festival atmosphere! Tickets for ‘Woofle’ are £2 each and all events in the Alley Theatre Courtyard are free. For more information visit www.alley-theatre.com or call 028 71 384444.